Game Masters shouldn't waste their time sketching maps whenever characters set out on a trip. 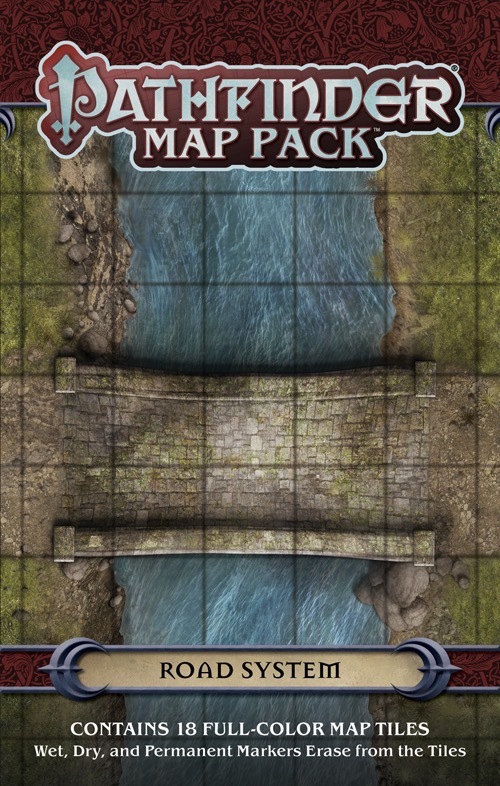 With Pathfinder Map Pack: Road System, you'll always have dangers ready as your adventurers make their way into the wide world! Attractive, but Unsure about Usefulness . . . 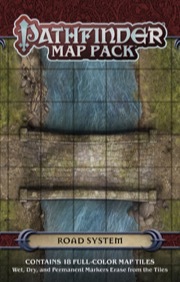 I'm honestly torn about the usefulness of Road System, the first product I've purchased in the Pathfinder Map Pack line. The product consists of 18 full-colour tiles, each 5 squares wide and 8 squares long and containing a section of a dirt road or (on two of the tiles) a stone bridge across a narrow stream. The tiles can be arranged in whatever order wished, such as one long road or a shorter road featuring crossroads and intersections. 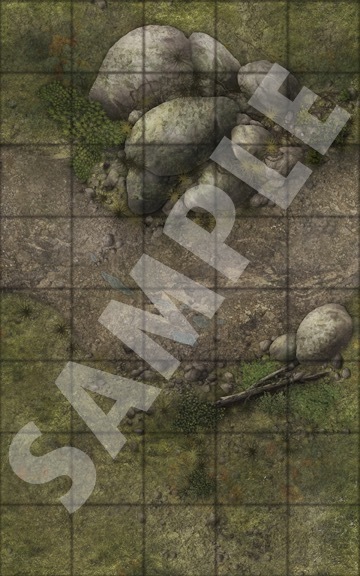 The artwork on the tiles is really good, as everything from muddy puddles to a felled tree to clumps of boulders are added in for some interesting terrain features. The tiles, which are single-sided only, allow for wet, dry, and even permanent markers, so a GM need have no hesitation in adding an overturned wagon, a dead horse, or whatever they'd like. I picked up Road System as an aid for random encounters when PCs are travelling from place to place. I've only used the pack once, so my comments should be taken with a grain of salt. My main concern is that, as pretty as the road looks, it's obviously too narrow to contain a full-fledged encounter. This means the tiles have to be used in conjunction with an underlying map which isn't going to be nearly as attractive, and on which the GM will still probably want to add minor terrain features to add realism (unless the road is going across a featureless plain). Because the easiest thing to draw on a blank play-mat is a set of parallel lines to make a road, I'm not sure how much "value-add" the map pack is actually providing. 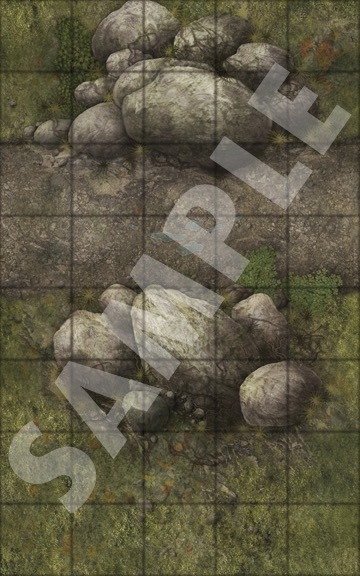 It may be possible to combine a wilderness-themed Flip-Mat underneath Road System tiles, but I'm not sure how well the two would mesh together. So all in all, the reason I'd give this an average score isn't because there's anything wrong with the set, but only because I'm not convinced yet of its usefulness. um, there is not an image or any information on this product page Liz, devious goblins!! This could be really cool, especially if we get a couple of lengths of road that go with different terrains that we already have. One request would be some nice, wide highway-grade roads. We get some dirt tracks here and there, but a good 20'-wide cobbled highway would be awesome. Any thoughts on how to avoid the 90º angle problem? Straight roads work great on cards, and crossroads, but most real roads don't just turn at 90º. I don't know how it would work, but a couple of 45º sections or even a curve would be awesome. Updated with final product image, sample images, and description. I'm curious... how do people stick these tiles together, or at least, keep them from moving around while using them? Scotch tape and masking tape are both terrible since they pull the outer layer off (I put it on the back-side, fortunately). Is there some "low-stick" tape that would be better? I put them under a heavy sheet of transparent acrylic that pins them down with its weight. Hmm, well, I do have one of those. Yep. All it takes is one piece of blue painters tape on each card. Peels right off the card and doesn't harm the table surface. One thing I've always wondered about these, and I own one of the forest packs, so it obviously hasn't prevented me from buying: why aren't they double sided? Making them double sided would greatly increase the number of combinations possible... I have exactly zero publishing knowledge so there might very well be a really simple reason that I don't see, but if these could be made double sided, it would certainly give a lot more bang for your buck. It would simply cost more to do them double-sided. So the blue painter's tape is low enough tack? Very cool, I will try it, instead. Regular masking tape is just as bad as Scotch tape, as I discovered the other day. Oh, and thanks for the comments.